Israel's National Library receives one of two surviving copies of Prague Haggadah. Just prior to Pesach (Passover), the National Library of Israel revealed that it had acquired the velum Prague Haggadah two months ago, when the library purchased the famed Valmadonna Collection of Judaica. The Haggadah was printed in Prague in 1556. 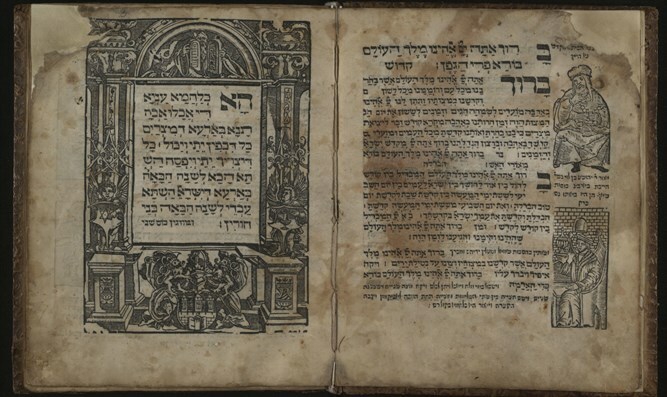 A previous Haggadah was printed in 1526, but no copy survived. Several elements of the 1556 Haggadah, such as the illustrations, were found in another Haggdah printed 30 years later and continued to be printed the same way for hundreds of years. Only two copies of the Prague Haggadah have survived. One is preserved in a London library, and the second is the one that is now in Jerusalem's National Library, together with the other rare items in the Valmadonna Collection. The Valmadonna Collection is considered the most important private collection of Jewish books in the world. It contains over 10,000 books and other items printed in Hebrew, dating from the beginning of the 15th century, among them an incunabula of the Pentateuch, printed in Lisbon in 1491 . In addition to rare Hebrew books, the collection contains over 100 manuscripts dating from the beginning of the sixteenth century. Created by Jack Lunzer, a British industrial diamond merchant who was born in 1924 and died in London at the age of 92, the collection is named after the northern Italian city of Valmadonna, where Lunzer and his wife had personal and family connections. One of the first printed Haggadahs, the Prague Haggadah was scanned this week and will be available for viewing on the National Library's site. According to the National Library's Judaica Collection Head Dr. Yoel Finkelman, the Prague Haggadah is important not just because of its age and rarity, but also because it was one of the first original Haggadahs to include illustrations using pieces of wood and employing different fonts - elements which became essential to later Haggadahs.